Cute little shop, wonderful quality! They were so so easy to work with! 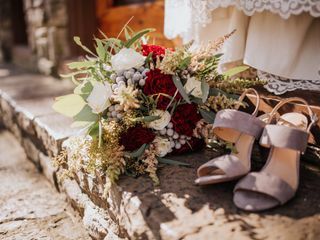 I loved all the details that went into my bridal and bridesmaids bouquets. Beautiful pictures! Thank you so much for the awesome review!!! Congratulations again on your wedding, wishing you the best! Highly recommend! Our flowers were beautiful and the set up was perfect! Thank you so much for taking the time to review us Ashley! We were honored to be a part of your special day, you made such a beautiful bride! I couldn't be happier with choosing A Rose Garden to be the florist for my wedding! 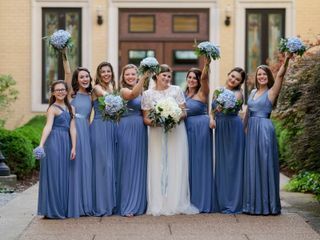 When I contacted Chelsea about the wedding - I didn't even know what my bridesmaid dress colors were going to be and she was so helpful in providing me options that would complement the different colors I was considering. 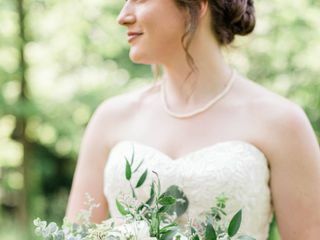 I chose to use a lot of greenery for my bouquets, boutonnieres, aisle decor, and arbor decor, and I was blown away at how great everything turned out - better than I could've imagined! 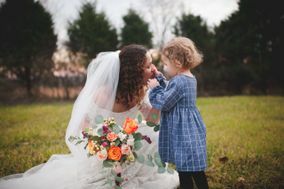 Chelsea gave me plenty of options to stay in my budget and provided alternatives for flowers that would last longer in the sun (we had an outdoor ceremony/pictures). I can't recommend Chelsea and A Rose Garden enough! 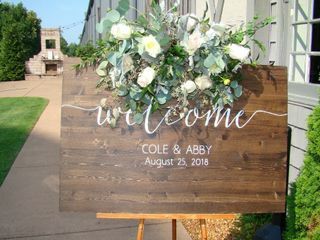 Everything was delivered on time (even early, actually, as my pictures began early in the day) and Chelsea was super easy to contact throughout the whole process. 10/10! Thank you so much for taking the time to review us Kelsey! We greatly appreciate your business and loved being a part of your special day! All of my bouquets and arrangements were perfect and better than I imagined! 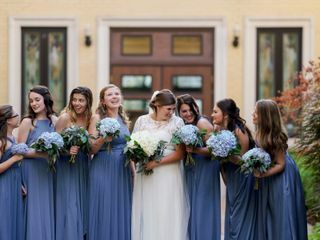 Chelsea was a dream to work with-I emailed pictures, described what greenery I liked, and sent her my budget-she basically had everything lined up just how I asked for our first meeting. She was very quick in responding to my million questions and was very flexible as I had a few changes closer to the wedding day. She worked very hard and did her best to stay within my budget which I greatly appreciated. She offered suggestions and advice for things that I hadn't really thought of. Everything was FABULOUS! Thank you so much for taking the time to review us Amber! It was a pleasure working with you on your special day! The courtesy and beauty that A Rose Garden staff bestowed to my visions for the flowers in my wedding was incredible! I used their services for an exquisite arbor piece, bouquets, boutonnieres, and corsages. 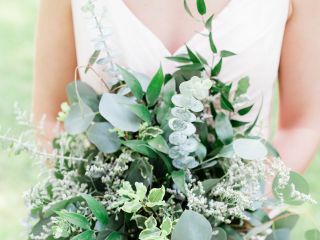 I was really decided on the types of flowers I wanted to use but the greenery and accents were totally up to their artistry and they did not disappoint! I had a very simple, elegant taste in flowers and Chelsea kept within these requirements and delivered THE most beautiful florals! I urge you to book their services for your next event because aside from their talent and professionalism, Chelsea and her staff are so nice and genuine and you can't beat that in today's business world! Thank you so much for taking the time to give us such an amazing review Ayriel! Congratulations again, and thank you for giving us the wonderful opportunity to be a part of your most special day! Rose Garden was absolutely perfect! I had a destination wedding and was only able to send photos of what I wanted. The totally understood my vision and made perfect bouquets at a reasonable price. They were gorgeous and I couldn't have been happier! Thank you so much for taking the time to review us Kiirstyn! We were honored to be a part of your special day! After looking at and speaking to several florists, we chose A Rose Garden for our fall wedding. We couldn't have been happier! The bouquets, boutonnieres, arch, halo...everything was beautiful. Chelsea is friendly, helpful, easy to work with, and very professional. I would recommend them to anyone. Thank you so much for taking the time to review us Lorrie! It was an honor to be a part of your special day! Chelsea and her team are absolutely amazing! She listened to exactly what we wanted and delivered flowers that were even better than we imagined. We are forever grateful! Love, love, love this flower shop! My experience with A Rose Garden was amazing! My story is a little interesting. I thought I would try to save money on flowers and have a family member do all the flowers for me. Everything was great until I put by dress on my wedding day and held my bouquet. I hated the way they looked together. The person who helped with my flowers was busy getting everything else ready so I couldn't bother her with fixing it. I immediately freaked out. It didn't take long for someone to say, "We have to call Chelsea!" And on her afternoon off, with no questions asked, guess who was there to fix my bouquet?! She snuck in the back and whipped that thing into exactly what I had pictured! She really does work for YOU! Thank you Chelsea for saving the day! Thank you so much for such an awesome review! A Rose Garden was an absolute dream to work with! 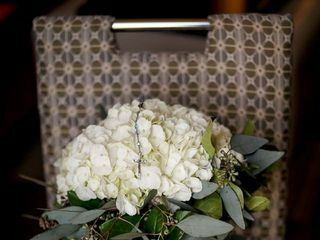 Through the whole planning process, I never had to worry about my flowers because I knew my business was in good hands. My wedding day would not have been the same without them! Thank you so much for that awesome, thoughtful review! We loved working with you and really loved designing with the flowers you chose! Best wishes for a long and happy marriage! Chelsea and her staff were AMAZING. They were so easy to work with and understood what I wanted even when I didn't really know. The bouquets and boutonnieres were gorgeous! Lauren, thank you so much for taking the time to write this amazing review! We love getting positive feedback and love how happy you were with our services!! We hope you're wedding day was everything you wanted and more and we wish you all the best in your marriage! Congratulations and thanks again!!! Chelsea at A Rose Garden made the most beautiful bouquets I have ever seen in my entire life. I was absolutely in love with the flowers she did for my wedding. She was very patient with me as I was trying to describe what I wanted, and she gave excellent suggestions to help me get just what I wanted. She was available anytime I needed her, and she responded very quickly. I would recommend her to anyone for any floral needs. Excellent! I was honestly dreading planning the floral arrangements, but A Rose Garden made it so simple and beautiful. The team listened to what I wanted, and created perfect pieces for me and the party. They were easy to work with, flexible, and so helpful throughout the entire process. The quality and beauty far exceeded our expectations, and added so much to the wedding day. I'm glad A Rose Garden Florist was a part of our day!